I KNOW! I love it so much! Great pick! Very nice cover. Glad you got your wish for the sequel. I totally agree with you that cover is gorgeous! I hope you enjoy this book. I completely agree! So eager for this one!! Holy crap that cover is stunning! Like you said, I thought Wintersong's cover was great, but this cover blows it out of the water! I don't know if I'll read this series, but the covers sure are great! Haven't read the first one in this series yet. My TBR pile is HUGE right now. This cover though is gorgeous. Ooooh, I haven't seen this cover until now! I still need to read my copy of Wintersong but I'm so looking forward to it! I never read the first one but OMG this cover is gorgeous. I still haven't even read the first book...I'm slacking. lol! Maybe I will wait to buy the first one until I see how much people like the first one. haha That cover is so pretty! Hope you love this one! Yesss, this is so gorgeous. I might have cried if they'd changed from the original cover style because it was just so pretty! They match so beautifully! Great pick, Alyssa! I still need to read Wintersong. Great pick! That is an amazing cover- totally agree! Wow. The cover of this one is stunning! I haven't read the first one in this series, but I'll have to check it out. I had mixed feelings about book 1 but hopefully book 2 will be even better. I hope you enjoy it! I'm also really looking forward to this one! And I totally agree - that cover is divine! I also loved the cover for the first book and I like that they are keeping a similar trend. Great pick! 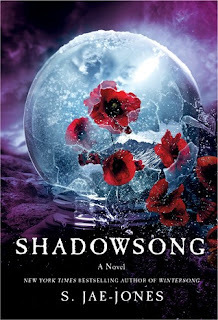 That is such a beautiful cover but I still need to read Wintersong.